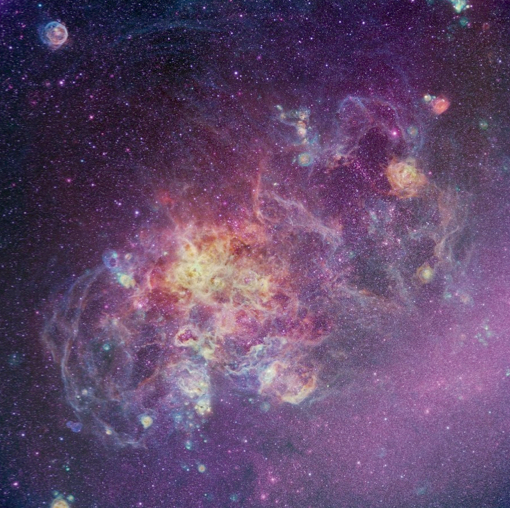 The Tarantula Nebula in Large Magellanic Cloud (Credit John P. Gleason). The very high energy gamma ray source N157B is located roughly in the center of this region, see also annotated animation (NASA). The Large Magellanic Cloud (LMC) is a satellite galaxy of the Milky Way at a distance of 48 kpc, with an apparent extension of about 10 degrees. It harbours several interesting objects, known to be possible gamma-ray emitters, including in particular the 16 ms pulsar PSR J0537−6910 with the largest known spin-down power among pulsars, of 5x10^38 erg/s. This pulsar is part of the composite supernova remnant N157B, which resembles the Crab supernova remnant in its morphology, with radio emission from the central region of the remnant and a poorly-defined shell (e.g. Lazendic et al. 2000). Within a fraction of a degree of this remnant is the 24 year old supernova 1987A, for which an increasing gamma-ray flux close to the H.E.S.S. sensitivity is predicted (Berezhko et al. 2011), and the center of the star forming region 30 Doradus (also known as the Tarantula Nebula), most likely a region of high cosmic-ray density and hence of gamma-ray emission. Given this collection of interesting objects, the region of the LMC containing N157B, SN 1987A and 30 Doradus has been observed with a H.E.S.S. on a yearly basis since 2003, with very deep exposure added in 2010, for a total of 90 h of live time. Fig. 1 shows the very high energy gamma ray sky map obtained from these observations. Unlike in the Fermi data at GeV energies, where extended emission is observed from 30 Doradus region (Abdo et al. 2010), at TeV energies a single point-like source emerges, with high significance of 14 standard deviations. The location of the very high energy gamma ray source is consistent with the position of the supernova remnant N157B, containing the pulsar PSR J0537−6910, see Fig. 2; The nearby Supernova 1987A does not show a significant gamma-ray signal. Fig. 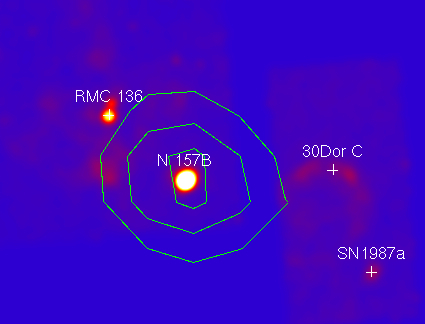 3 shows the Chandra X-ray image zoomed in on N157B (Chen et al. 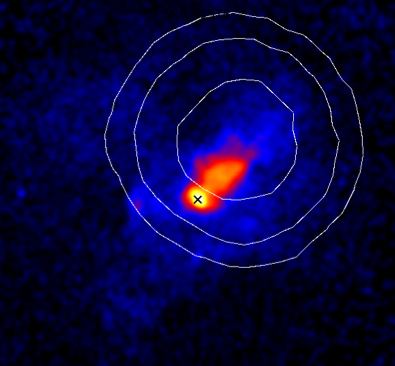 2006), revealing a X-ray nebula of 0.6 pc x 1.7 pc size at the pulsar location, with a > 5pc long tail; also shown are the 68%, 95% and 99% error contours for the position of the gamma ray source. The location of the gamma ray source detected by H.E.S.S. is consistent with the pulsar location. The gamma ray luminosity corresponds to about 8% of the spin-down energy loss of the pulsar, within the range of conversion efficiencies observed for other pulsar wind nebulae, so that the association appears plausible. The pulsar wind nebula N157B is the first extragalactic stellar object detected in very high energy gamma rays. Reference: "H.E.S.S. 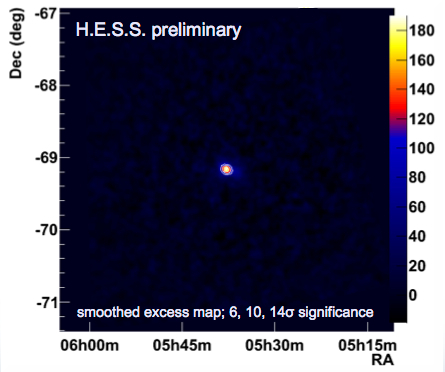 observations of the Large Magellanic Cloud", H.E.S.S. collaboration, Nu. Komin et al., Proc. of the 32nd International Cosmic Ray Conference, Beijing, 2011. Fig. 1: H.E.S.S. very high energy gamma ray image of the LMC region, with 6, 10 and 14 sigma significance contour lines. Fig. 2: Chandra X-ray image of the source region, showing the remnant/pulsar N157B, the 30 Doradus region and the remnant of supernova 1987A. Superimposed are the 6, 10 and 14 sigma significance contours of the very high energy gamma ray emission. Fig. 2: Zoom into the N157B region of the X-ray image. The black cross marks the location of the pulsar PSR J0537−6910. The white rings correspond to the 68%, 95% and 99% error contours for the location - i.e. the centroid - of the very high energy gamma ray source.